We have had record snow storms and low temperatures already and December is just showing up to the party. The ground where I live in USDA Hardiness zone 5b is still workable so I am hoping the moisture will replenish depleted water tables and still let me do a little last-minute garden work. Any broken branches and limbs? Get those trimmed before ice hits, or before someone runs into them visiting for the holidays. You know where they are but people knew to your property are bound to run into them. As soon as a hard frost hits, it will be time to mulch. Mulching maintains the soil at an even temperature. 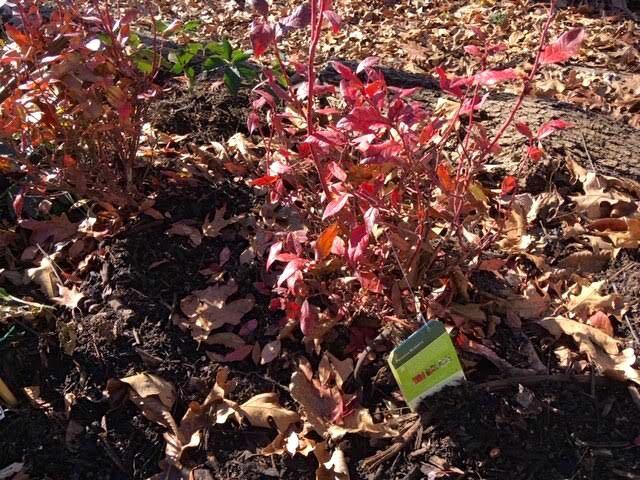 During winter, the point of mulching is to keep plants in hibernation. If you still have leaf piles, move those into flower beds, those will also make good mulch. To mulch trees, make a well around the tree trunk and leave an area the width of a tire between the tree trunk and the mulch. When mulching, don’t pile mulch up to the trunk or you will create an area for diseases. Leaving a little moat around the tree also reduces girdling. Have empty pots, garden carts, rakes leaning against the side of the house? It’s time to clean them off and store them for the season. The rakes, in particular, you don’t want to step on the tines and hit yourself on the side of the head. 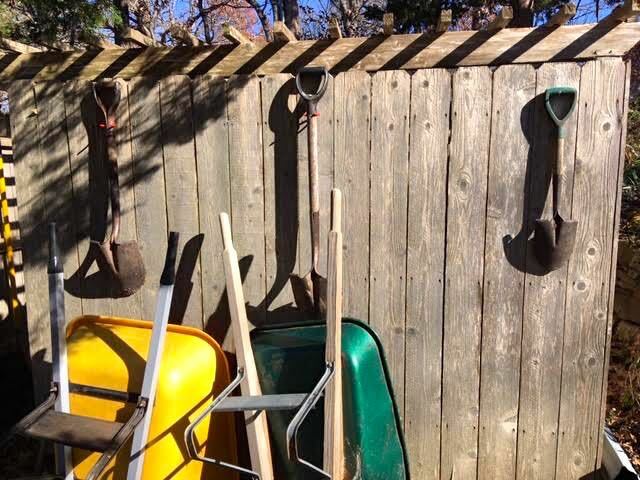 I have my shovels now hanging from where I usually end up leaving them at the end of a hard day of gardening, easier to find later. Leave the dry flowers for now. Birds will eat the seeds and the dry greenery will provide protection for the young shoots growing at the base of the plant. Did you plant mums this fall? Remember to water them every couple of weeks this first year. Once they make it through their first winter, mum roots will become established and won’t require regular watering through winter. If you saved seeds, this is the time to make sure they are marked and stored in a dry, cool place. Some people store them in a refrigerator. I use an old ice cooler in my garage to keep mice from snacking on the bags through winter. Still have trees you haven’t planted? There’s still time so get them in the ground and water well. If you are getting a live Christmas tree, dig the hole now so you can pop it in the ground right after Christmas. Let tap water settle overnight before using on house plants. Tap water can be too cold and may have additives that need to evaporate before being exposed to indoor plants. I fill my recycled milk jugs and let them stand overnight before pouring on inside plants. Have bulbs ready to bloom through winter? Paper white narcissus, hyacinths and Amaryllis are all good choices to bloom when it’s cold outside. The first two can also be permanently planted outside and Amaryllis are repeat bloomers. Make sure to make notes in your garden diary for next year projects, I seem to remember them this time of year as I am putting things away. Give your gardening friends a gardening-related gift. It almost be winter but gardeners are planners and are already thinking about spring!